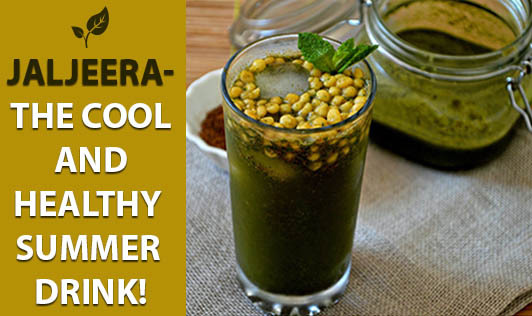 Jaljeera- The Cool And Healthy Summer Drink! Summer is here again with the burning heat and the uncontrollable thirst! You are just not able to quench your thirst with water and you reach for a soft drink or a packed juice even though you know it's not healthy. So what can you replace it with? As you've already read, it's jaljeera- the Indian summer drink which is packed with flavor and nutrition. Jaljeera is prepared from a mixture of powders and leaves. Here are the ingredients and their benefits that make this drink so good! 1. Black salt: This is the major ingredient in jaljeera which gives it its unique taste. It has a cooling effect on the body and aids in digestion. It is also believed to relieve intestinal gas and heartburn. 2. Cumin: Cumin is an excellent source of iron and helps in preventing and treating anemia. It aids in digestion, improves immunity and keeps your body cool, which is very much needed in summer! 3. Ginger: It is called the "universal medicine". It is used in the treatment of nausea, vomiting, menstrual cramps, arthritis, intestinal gas and several other disorders. 4. Dry mango: Dry mango or amchoor powder is high in vitamin C which helps to improve immunity. 5. Asafetida: More commonly known as ‘hing', asafetida has many health benefits. It reduces flatulence, digestive distress and constipation and is an excellent laxative. 6. Water: Improves skin, purifies blood, keeps you hydrated, removes toxins and cools your body. There are few more ingredients which go into making Jaljeera like pepper, chilli, mint, rock salt, sea salt etc. You can either make it fresh at home or buy Jaljeera powder available in the market. All you have to do is mix it with water and relish it!